The Sand fire burns out of control along near Acton, California, on Sunday. What distinguishes the Sand fire isn’t its size — there are at least 500-odd fires that have been larger in the last 15 years — but its size given its location. The fire has burned at least 59 square miles, and breached the city limits of Santa Clarita, a city with nearly 180,000 people. In Southern California, this type of urban-adjacent wildfire is all too common. 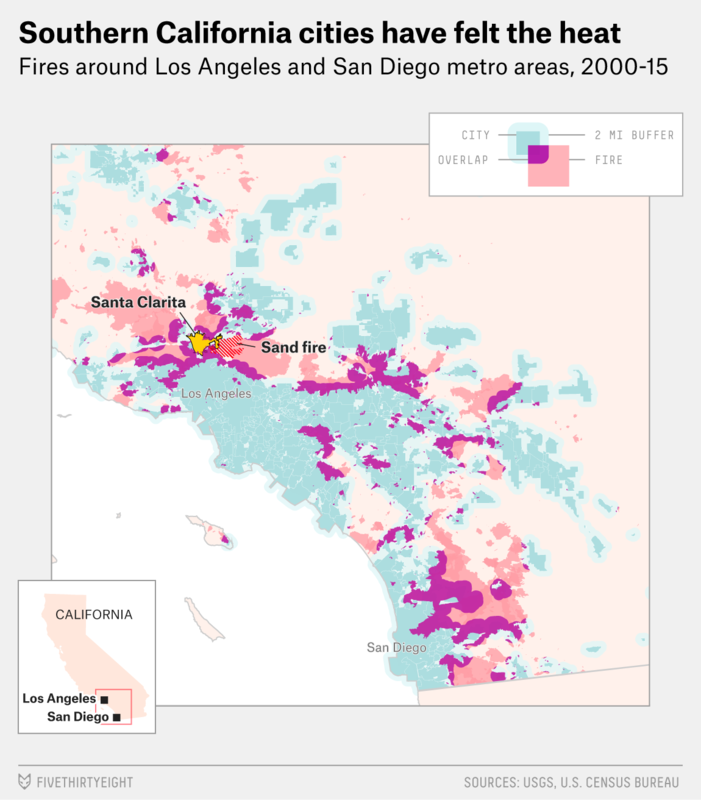 Though the majority of the land scorched in the Sand fire is public and less developed, flames have also spilled into the “wildland-urban interface” (or WUI), which is “where houses meet or intermingle with wildland vegetation,” in the phrasing of the Forest Service. Fires in the WUI are often harder and costlier to fight. While firefighters work to protect homes and property, they are unable to focus on suppressing a fire, giving wildfires more opportunity to spread farther and last longer. Protecting homes also requires more expensive equipment such as planes and helicopters and more personnel, adding to the cost. These financial burdens strain an already tight Forest Service budget: 52 percent of the Forest Service budget for the 2015 fiscal year went toward fire-related costs, up from 16 percent in 1995. What’s more, as suppression costs rise, less money goes toward conservation programs that could reduce fire potential. The Sand fire is one of the largest fires in such close proximity to a city in the past 15 years. To see where it ranked, I looked at U.S. Geological Survey data on the locations of fires for the last 15 years1 and the locations of those fires relative to cities,2 adding a two-mile radius to city boundaries to roughly account for the WUI area beyond official city borders. With all that data gathered, I looked for the largest fires that have come within at least two miles of a city with a population of at least 50,000, and got this list. To find the culprit for California’s fires, says Forest Service Chief Tom Tidwell, who began his career fighting wildfires in Idaho, look no farther than the historic drought impacting the state: “If you look at the map of where drought is most intense,” he says, “it often overlaps with where you have these catastrophic fires.” Most of Los Angeles County is currently in a zone of “exceptional drought,” according to the U.S. Drought Monitor. Unfortunately, in Southern California, these severely dry areas also contain a lot of people, many of whom live in the fire-vulnerable WUI. A third of California’s homes are built in the WUI, and California has the most homes (and the greatest population) in the WUI of any state. When I looked to see which cities4 in the country had the most fires, 11 of the top 16 were in Southern California, including Santa Clarita, which was third on the list. The fire danger for those who choose to live in the WUI is only increasing. According to Tidwell, climate change has resulted in a fire season today that is 78 days longer than it was in 1970 and fires that burn hotter and faster. “It used to be unusual for a fire to burn 10,000 acres in a day, now it’s almost becoming the norm,” he told me. The Sand fire, which burned more than 10,000 acres on Sunday, is currently 85 percent contained and no longer extending its perimeters. However, it is only one of 18 large uncontained fires currently burning across the American West. While the 2016 fire season is not yet over, 2015 set the record for most U.S. acres burned in a year at 10 million acres. As people build more in the WUI — up to 44 million homes in 2010 by one Forest Service count — these changing dynamics of fire put them at risk. “Today, almost any large fire will directly threaten or have the potential to threaten homes in the WUI,” Tidwell said. So should we all abandon our homes in scenic forested areas and take to the relative safety of concrete and pavement? Basic precautions can be taken, says Tidwell, that will greatly reduce the risk of fire, even in the WUI. Homeowners should retrofit structures with fire-resistant materials and create “defensible space” around their homes that is clear of brush and other potential fuel. Dr. Kimiko Barrett, a geographer at the non-profit research group Headwaters Economics, agreed and added that local decision makers have an important part to play in reducing the threat of fire. After the devastating Cedar fire in San Diego in 2003, the city implemented strict brush management policies for homeowners with regular on-site inspections. “The unfortunate thing,” Barrett said, “is that awareness often comes after the fact.” We shouldn’t wait, she said, for a devastating fire to remind us that we must protect ourselves against disaster. The USGS relies on local reporting of each incident to collect its fire perimeter data; there may be fires that occurred but were never reported. The data I used does not include fires from 2016, so the ranking is provisional. Cities include Census Designated Places (CDPs), which are unincorporated areas of concentrated populations that are identifiable by name. All census data is from 2014. The list does not include fires that have occurred in 2016. Cities with a population of 50,000 or greater within their city limits.